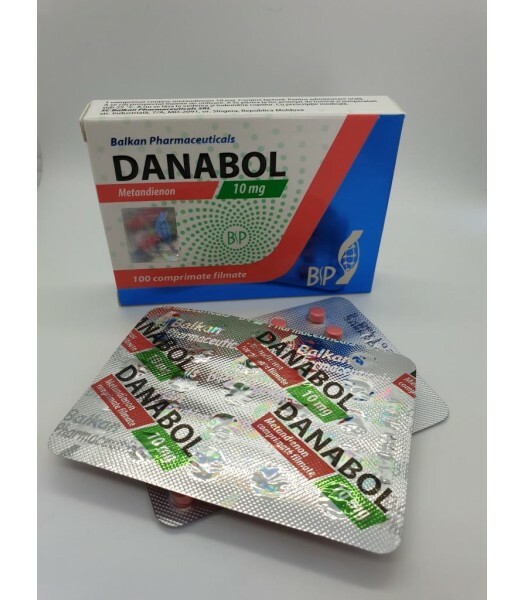 Danabol produced by Balkan Pharmaceuticals represent an synthetic oral steroid which contains an active substance named Methandienone in quantity of 10mg per tab. It is usually comercialized in 100 tabs pack. In bodybuilding it is very popular and considered one of the strongest steroids. It is also known as D-bol. After using it athletes report very fast strength and mass gain. Methandienone is that kind of steroid that can be used in both cutting and bulking cycles. Just from the first weeks after taking hormone bodybuilders can see results. For better result athletes often stack it with Testosterone Enanthate inj. and Deca-Durabolin inj. in bulking cycle. Many athletes use it between cycles and as a means to recovery from a cycle. Methandienone is taken in a low dose of 10mgs/day during PCT or in between cycles to keep androgen levels high and to maintain strength and mass, while allowing the body’s natural testosterone levels to be regained. Also this steroid is often used because of it propriety to make muscles stronger during workouts. This is results of increases protein synthesis and nitrogen retention within the muscle cells. Other positive characteristic that make it liked between bodybuilders is the fact that it stimulate the protein synthesis, makes the tissue nutrition better, helps the calcium to stack in the bones. Avarage dose for male bodybuilders is 25-100mgs a day for a period of 4-10wks, and 10mgs a day for bridging or PCT purposes for as long as needed. Side effects that can occur after taking Danabol: gynecomastia, acne, oily skin, hair growth on the whole body. To avoid side effects it is good to stack this hormone with Tamoxifen citrate orNolvadex.